Without revealing too much about the client or the project, the problem was simple: The fonts used in the website design were not the best choice. Inadequate kerning, leading, and measure. Before we move on, one last point about x-height. As I mentioned earlier, x-height is the distance between the baseline and meanline of letters. It’s this feature that impacts a reader’s perception of the size of a font. 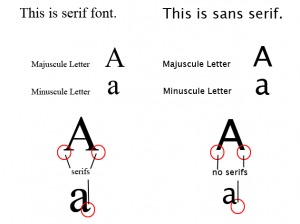 For example, look again at the first image in this post showing serif and sans serif fonts. 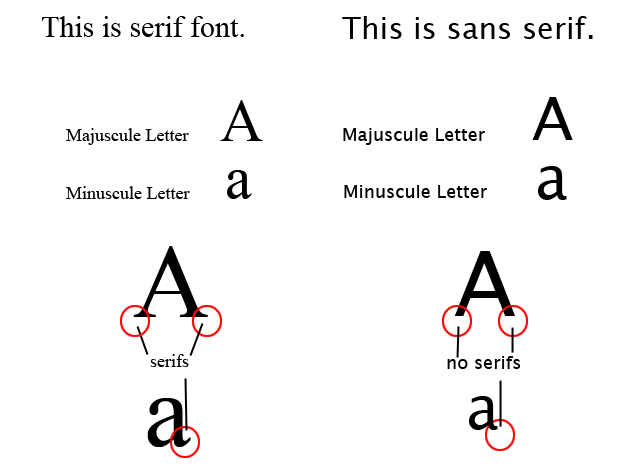 The sentences “This is serif font.” and “This is sans serif.” are both 60pt. font. However, the serif font, Times New Roman, looks smaller than the sans serif font, Lucida Grande. This is because of the difference in x-height. A smaller x-height means a font will look smaller to readers. Kerning, the adjustment of space between individual letters. Measure, the length of a line of text. Kerning, if too small, can lead to overlap between letters, rendering them illegible. Rounded letters (o, c, e) will experience this sooner than straighter letters (i, l). On the other hand, too much spacing can destroy the perception of a word itself, or make the whole copy look ugly. This concept applies to paragraphs of text as well: too much spacing between words can destroy the continuity of the paragraph, making it difficult to understand and less than aesthetically pleasing. Leading can also make or break the legibility or aesthetic quality of copy in a design. For fonts that tend to have less whitespace around them, such as smaller fonts and fonts with larger x-heights, larger leading is necessary to ensure readability of the text. Leading also interacts with line length, or measure. To sum that relationship up, the longer the line length is, the more you should consider increasing leading to reduce the likelihood of readers doubling over lines. 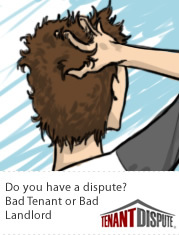 With measure, a bit more explanation is required. As stated before, measure refers to the length of a line of text. Research has demonstrated that long lines of text force readers to search for the start of new lines of text in paragraphs. Also, longer lines of text with inadequate leading will cause readers to lose their spot and read the same line multiple times. (This plays a bit on short term memory–so much information coming in over an extended period of time will make it hard for the reader to recall what they initially read.) Conversely, shorter lines require a lot of back and forth eye movement on a page that can lead to visual fatigue. That being said, line length is governed by the amount of copy in a design, the size of the font, and perhaps any sort of effects you mean for the text to create in the design. Now, we can address the second issue: Creation of unnecessary ligatures. A ligature refers to multiple letters that appear joined together and form a shape. In the past, ligatures were used to aid the readability of certain letter combinations. And certainly, back when printing was a new technology, this helped readers recognize the words on the page. Now that most everything is digital these days, and that there are many different fonts to use, ligatures are not as necessary as they once were. 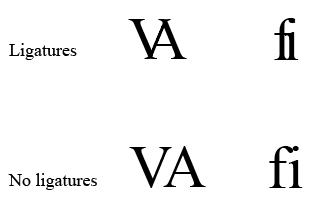 Does the image illustrate why ligatures might not be a good thing sometimes? More importantly, can you see how ligatures might be created? Putting all of the above concepts together, you now have the very basics of typography. I hope that it can help you in future projects recognize good and bad usage of type in designs. We are mad…crazy mad about product design whether it’s software or hardware, or just plain experiences. Our postings are from experts in the field of Wacko Web Designers, Psychotic Usability specialists, Human (maybe even animal) Factors, Bi-polar Human Computer Interaction, insane Software and Product developers, you name it. We love posting the good, bad and ugly side of design and usability of all things out there and welcome anyone sharing their thoughts and experiences with us. Thanks for visiting us and enjoy the content!